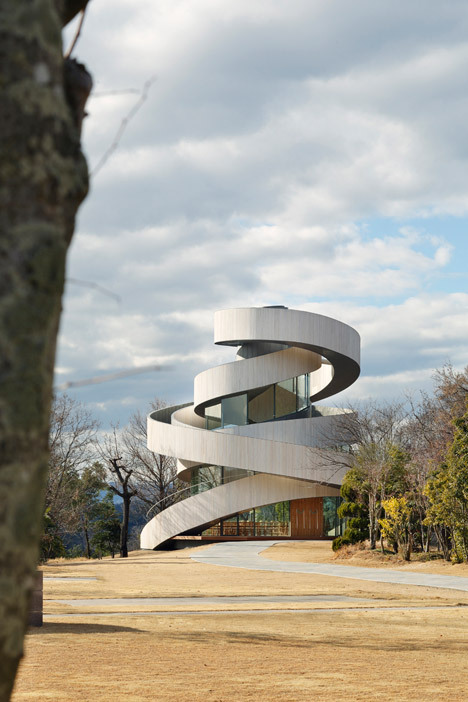 Two curving staircases encircle the exterior of this wedding chapel by Tokyo-based architect Hiroshi Nakamura, meeting at a rooftop platform that overlooks the Hiroshima coastline (+ slideshow). 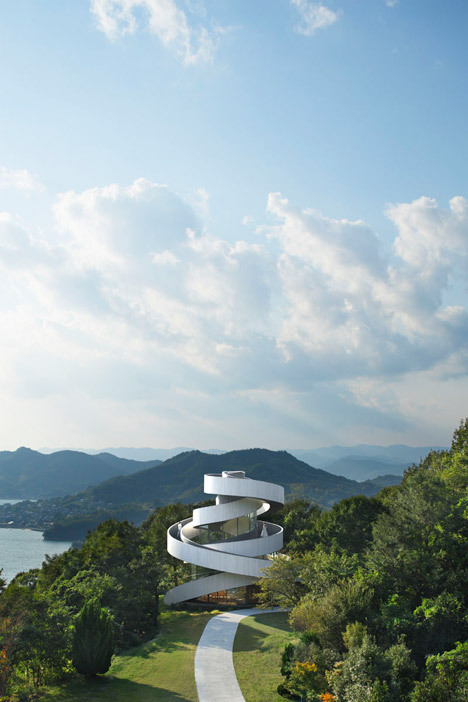 The 15.4-metre-tall structure is set on a grassy hillside in the grounds of the hotel Bella Vista Sakaigahama to take in views of the Seto Inland Sea, which borders the city of Onomichi in Hiroshima Prefecture. 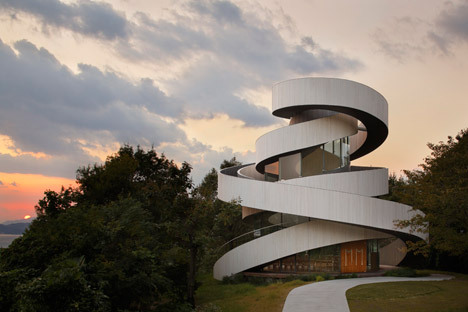 The intertwining staircases, which cross paths at several points to provide support for each other, are designed to be symbolic of the unity that matrimony brings. 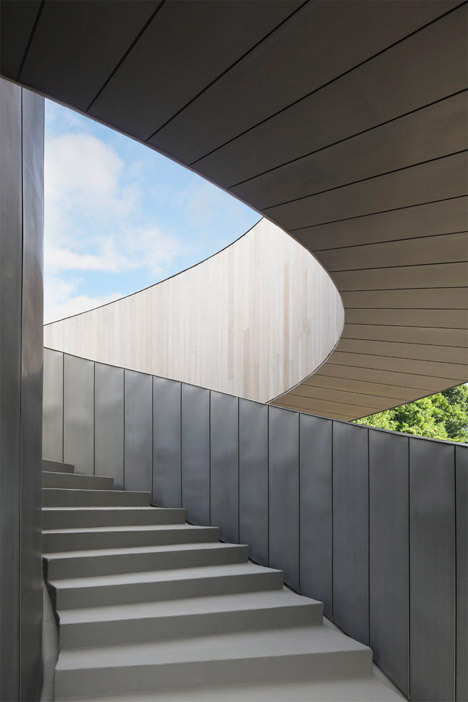 The stairs are clad in vertical planks of white-painted wood, and have curving titanium zinc alloy handrests to withstand erosion from the sea breeze. 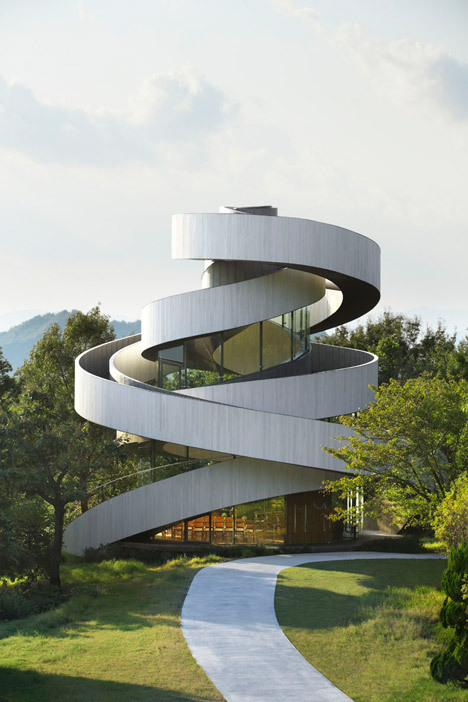 “Just as two lives go through twists and turns before uniting as one, the two spirals seamlessly connect at their 15.4-metre summit to form a single ribbon,” said Nakamura. 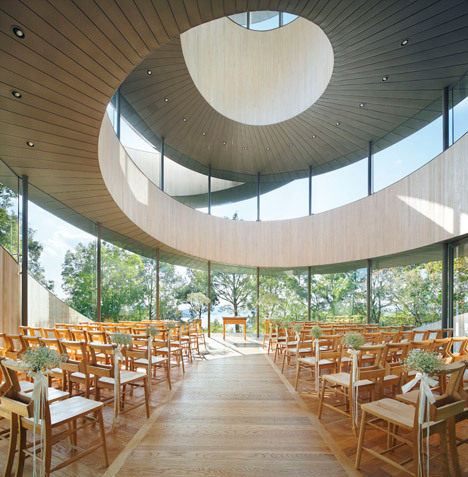 The body of the marriage ceremony is conducted inside the glazed chapel, where a wooden aisle bracketed by two banks of seating leads to an altar. 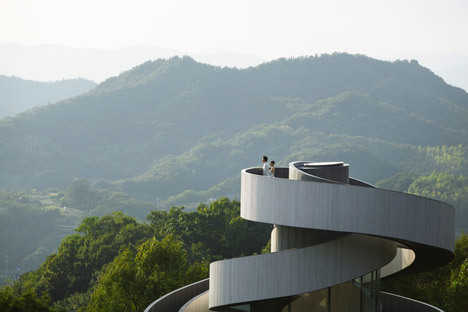 Nuptials are completed on the rooftop, where the two staircases widen and connect to unite the bride and groom who travel up separate flights. Once the vows are completed the couple can then pick one route to descend together. 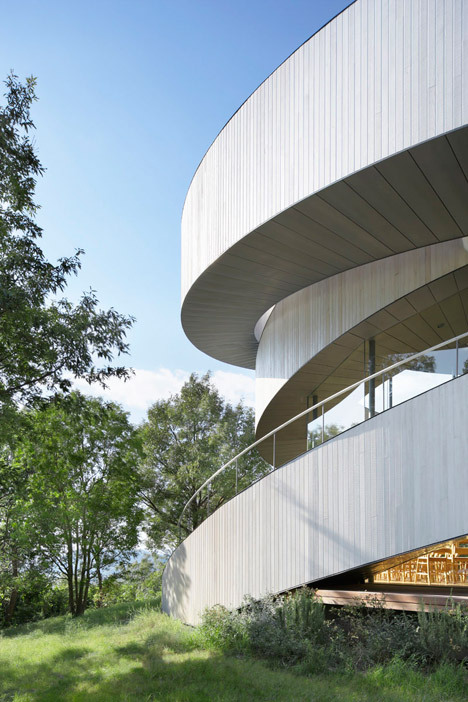 Aside from the symbolic nature of the structure, the architect said the double stairs were chosen to create a stable structure. 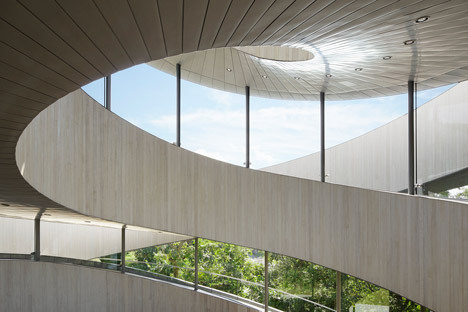 “By entwining two spiral stairways, we realised a free-standing building of unprecedented composition and architecturally embodied the act of marriage in a pure form,” he said. 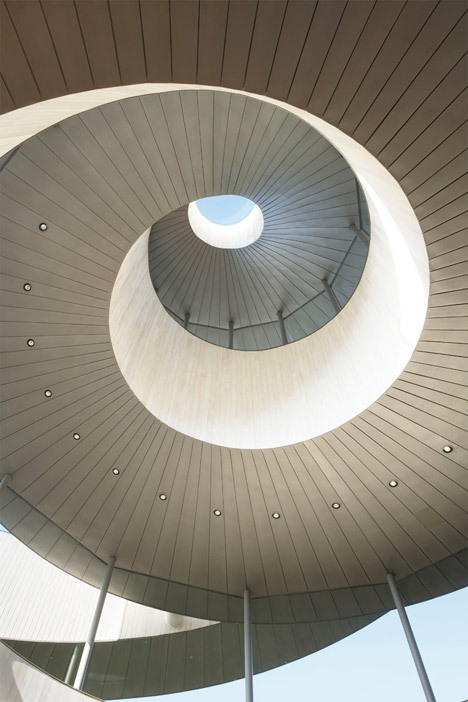 The two staircases support each other horizontally, while steel posts with a diameter of 10-centimetres bear the vertical load to form a stable structure. These posts, designed by engineering firm Arup, were deliberately slanted at construction stage and righted into a vertical position by gravity once the supports were removed. Photography is by Nacasa and Partners.